UXBRIDGE, Canada, May 29 2014 (IPS) - The world is increasingly hungry because small farmers are losing access to farmland. Small farmers produce most of the world’s food but are now squeezed onto less than 25 percent of the world’s farmland, a new report reveals. Corporate and commercial farms, big biofuel operations and land speculators are pushing millions off their land. “The overwhelming majority of farming families today have less than two hectares to cultivate and that share is shrinking,” Hobbelink told IPS. GRAIN’s Hungry for Land report provides new data to show small farms occupy less than 25 percent of the world’s farmland today – just 17 percent, if farms in India and China are excluded. Despite this they still provide most of the world’s food because they are often much more productive than large corporate farms. “We want the land in order to live and to produce, as these are our basic rights against land-grabbing corporations who seek only speculation and profit,” she said. With the launch of 2014 as the International Year of Family Farming the United Nations Food and Agriculture Organisation (FAO) and many agriculture experts acknowledged how important small farms are for feeding the world. However, they wildly overestimate how much land is being farmed by smallholders. “I couldn’t believe it when the FAO said family farms manage 70 percent of all farmland. This contradicts all of our experience with small farms around the world,” said Hobbelink. Researchers at GRAIN dug into mountains of data from every country as well as FAO statistics and information to find out who owns what. In many countries farmland ownership is very difficult to determine and there are varying definitions of what is a small farm or a family farm. Some giant corporate farms are family-owned. “Our report outlines how we did our analysis. We checked our findings with other sources and this is closer to reality than the FAO number,” he said. “It’s an important report and corresponds to our own research,” agreed Frederic Mousseau, policy director of the Oakland Institute, a U.S.-based policy think tank focused on global land and food issues. Small farmers can feed the future nine billion people on the planet if they have the land, Mousseau told IPS. Zimbabwe was harshly criticised by the international community for redistributing farmland to smallholders in 2000. They now produce over 90 percent of the nation’s food crops, compared to 60 to70 percent before 2000. 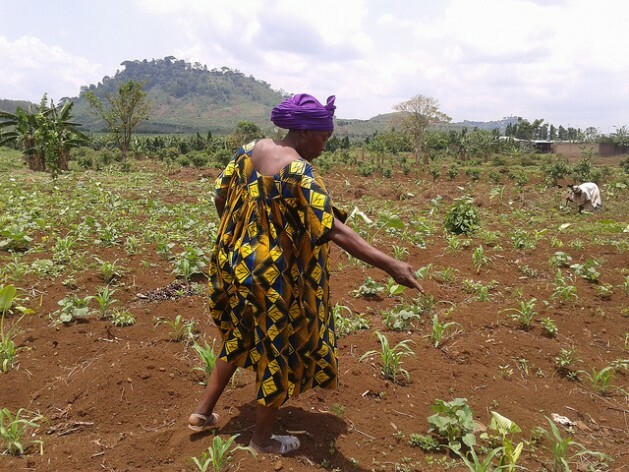 “More [Zimbabwean] women own land in their own right, which is key to food sovereignty everywhere”, said Elizabeth Mpofu, general coordinator of La Via Campesina. Since the 2008-2009 food crisis there has been a rush to buy up farmland all around the world by Wall St and financial institutions, said Mousseau. In developing countries an estimated 250 million hectares worth of land investment, also known as ‘land grabbing’, has occurred between 2000 and 2011. The same thing is happening in the U.S. In many areas the price of land has shot upwards pushing many farmers off their land. “U.S. farms are increasingly run by corporate farm managers who hire farm workers not farmers,” he said. Investors see farmland as a safe and secure investment, especially in the U.S., with its multi-billion dollar farm subsidies. As a result, an estimated 10 billion dollars in capital is already looking for access to U.S. farmland, according to the Oakland Institute’s Down on the Farm report. Over the next 20 years, 400 million acres, or nearly half of all U.S. farmland, is set to change hands as the current generation retires. Institutional investors are eagerly waiting to buy, the report said. That will be bad news for food production, farmland, the environment and the economy. The U.S. and far too many other countries have bought into agribusiness propaganda and financial lobbying that commercial, large-scale agriculture is how to feed the world, create jobs and grow the economy, said Mousseau. “Instead government policies need to be aligned to favour small farmers, not corporations,” he added. The hard evidence from many studies shows that small farmers practicing agroecological farming produce more food, protect soil and water, have far lower CO2 emissions and provide better livelihoods, said Hobbelink. “Small farmers give each hectare of their precious land far more attention and care,” he stressed.